1. 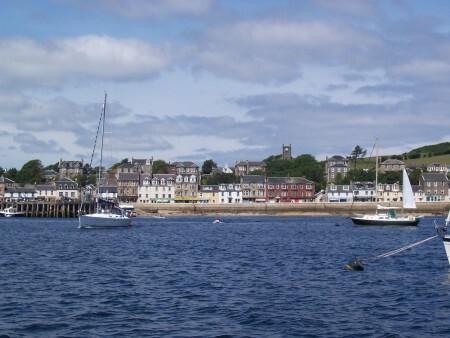 Millport is the only town on the Island of Greater Cumbrae. Located off the West coast of the mainland in Scotland it is a short ferry ride from Largs. Satellite pictures and maps show that the town sits at the south end of Greater Cumbrae. In decades gone by it was one of the most popular holiday destinations in Scotland, and still exerts its old-world charm on many visitors. It's very popular with cyclists who enjoy its easy and quiet roads. Naturalists love its abundant flaura and fauna. For families, it provides a safe environment where children can enjoy an active and safe holiday. At the end of a Saturday in the Summer visitors from Glasgow can be seen streaming off the Ferry back into Largs. The approach to the moorings is quite narrow and needs to be taken with care. The moorings are black cans, but with no pick up buoy, which calls for a little acrobatics at the front. This page has been viewed 5185 times.